When it was just Dougie and me at home, it was easy enough to get things done or let them slide. Dougie didn’t care if I didn’t get to the dishes, or the office needed to be dusted. He cared that I was there when he cried and that his needs were met. Life was easy… well, easier. I actually bought this when Dougie was just a baby but didn’t use it much unless we were going out. With Connie, we use it all the time. It lets me bring her along without losing any mobility myself and still having both hands free. It is built like a backpack so her weight is well distributed and I don’t get too sore. I even toss her in there to clean the house (we use mostly homemade cleaning products so it isn’t toxic for her). Right now, we’re restricted to front carries because she’s still so young but once she gets a bit older, she can be in a back carry. That really is the ultimate in mobility! I’m so glad that we’ve found a way to make sure that Dougie’s changing needs are still met while ensuring that Connie feels the same love and closeness that Dougie did. 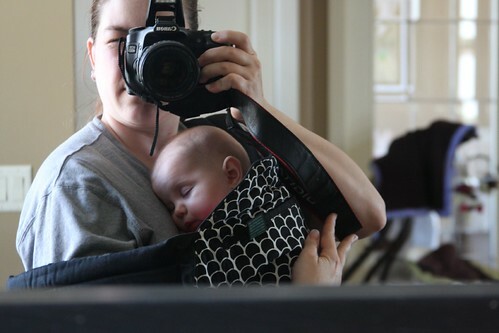 This post was inspired by the first time Connie fell asleep in this carrier. Normally, she is very interested in what is going on and just looks around but today, she got comfortable enough to fall asleep.